CHRISTIAN KEEL is a long-married believer as well as an avid student and teacher of the Bible. Keel enjoys playing with dogs during leisurely walks, working from home, getting together with friends, travels across the globe, and following Jesus’ calling to be a fisher of men—all in the company of a beloved spouse. Divorce - Remarriage and the Innocent Spouse by Christian Keel is a great, well balanced perspective for anybody experiencing divorce, or who knows somebody experiencing divorce. The book gives an in-depth, detailed analysis of the reasons for divorce, and what scripture says about it. Each chapter focuses on a specific issue, with Bible verses and analysis offered to describe what scripture means in regards to each subject. The writer mixes in true stories (with names and identifying information removed) to give readers examples of each topic as it relates to marriage, divorce, and remarriage. While focused, the book gives a wide variety of examples to show how it translates from Biblical times to the twenty-first century world. I read Divorce - Remarriage and the Innocent Spouse because somebody close to me is in the process of dissolving a marriage. Keel is correct in that divorce, while prevalent in our society, is rarely discussed and is regarded as something to be kept quiet, and yet, it’s a betrayal leading to a loss that’s worse than death. The advice mixed with Biblical reference and true accounts of failed marriages helped me understand the shame and grief caused by divorce, and why people strive to keep this pain hidden. 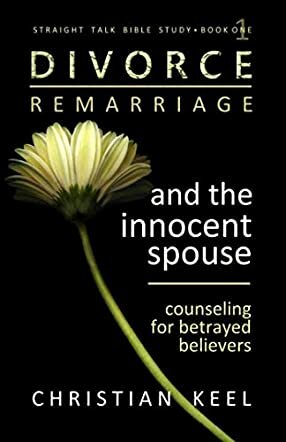 I believe this book is an excellent resource for Christians going through the trauma of divorce, with great advice on how to reconcile their hurt with their faith and move on with life. It can also be useful for private study, or in support groups. Keel offers a wonderful, nonjudgmental perspective on a painful topic. I highly recommend this book if you or somebody close to you experiences the pain of divorce.